Welcome back to 21 Days of Breakthrough Prayer! This simple series will provide you with Scriptures to pray into for 21 days, asking the Lord for your breakthrough. Today, we are praying for angelic assistance. This is a very simple series; I am not expounding on each Scripture very much, except through a bullet-point list to share some prayer pointers. I also am not writing out sample prayers, as I believe the Lord wants you to exercise your prayer muscles and make these Scriptures your own vocabulary for prayer. But, even though it’s a simple series, I believe it’s a POWERFUL one … and I want to hear your testimonies as the Lord answers your prayers, okay? 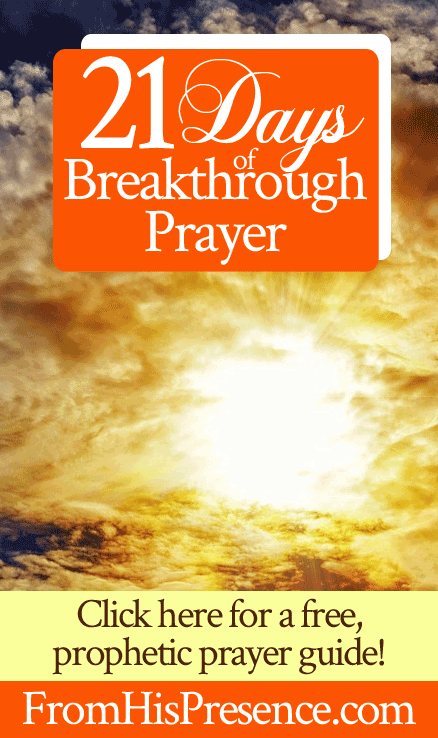 See the 21 Days of Breakthrough Prayer series table of contents here. For He shall give His angels charge over you, to keep you in all your ways. In their hands they shall bear you up, lest you dash your foot against a stone” (Psalm 91:11-12). Ask Father God to help you dwell in the secret place of the Most High–the secret place of His presence–continually (Psalm 91:1). Ask Father God to help you abide under His shadow (Psalm 91:1). Confess out loud to the Lord that He is your refuge and fortress; your God, in whom you shall trust (Psalm 91:2). Thank Father God for giving His angels charge over you, to keep you in all your ways. An angel brought food to Elijah in the wilderness. An angel released Peter from prison. Angels rescued Lot and his family from Sodom before it was destroyed. An angel brought an encouraging message of instruction to Joseph when he found out Mary was pregnant. An angel ministered to Jesus in Gethsemane. An angel showed the apostle John all around Heaven. Thank the Lord that His angels are at work in your life as well. Point out to the Lord that He is no respecter of persons; so what He did for others, He will do for you as well. Ask the Lord to TRIPLE the amount of angelic assistance you are currently receiving in your life. to bring you provision and resources from Heaven. Ask Father God to help you remember to test the spirits when you encounter them, so you’ll know they are holy angels from God. Ask Him to help you notice His answers to your prayers! Then thank Him for tripling the angelic assistance in your life, as well as all the rest of the above! Also related: Read what Rick Renner has to say about the power of legions of angels working on your behalf, here! That’s our breakthrough prayer for day 6! Remember to use the verse itself as your vocabulary for prayer. Doing so will not only help you pray the most effective prayers it’s possible to pray, but it will also help you hide God’s Word in your heart, that you might not sin against Him (Psalm 119:11). Did you pray this Scripture with me today? Or, do you have a testimony to share about how God has answered this prayer? If so, please leave a comment below! 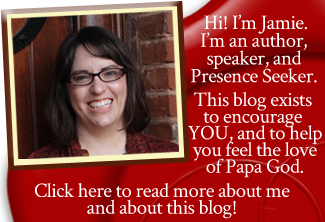 I’d love to hear what Papa is saying to you! Thank you so much for sharing your wisdom and time. May the presence of God continue to dwell in you. Everything your hands touch shall prosper. Thank you so much, Carmen. I receive that! When my youngest son was two or three years old, we used to spend the summer near a lake. One evening, my husband found him near the water, he was soaking wet and had obviously fallen into the lake which was very deep in that spot. He asked him what had happened, and our son answered that he had fallen in, but that his eldest brother had grabbed him from behind and had thrown him towards the beach. My husband looked around for our other son, but he was nowhere to be seen. He then realized, he was up in the cabin together with the rest of the family and there was no one else nearby. We have always believed that an angel kept our little boy from drowning that day. This is one of my favorites you have written and shared with us? And then their are the others seen as well. It is just so Awesome that He sent His only Son, Jesus, so that we have the opportunity to enter into the heavenly spiritual realm thru His amazing Love for each of us❤️?❤️ He so desires a relationship with us…just the best gift ever!!! Special Christmas Blessings upon you and yours this season???? I’ve had a few memorable encounters with God’s angels in my lifetime, two were when I was in grave danger. My most recent encounter during the day (I say this because I most certainly know and believe I’ve encounter spiritual beings in my dreams) was when I was very close to death, I had experienced a rupture in my colon and I was getting sepsis. An angel spoke right into my ear and told me exactly what was going to happen. When the surgeon came into my hospital room and told me what happened, he spoke the exact words God sent his angels to tell me and I knew I had heard from God and I knew I was going to be ok. Ironically, a plumbing break happened in our upstairs bathroom the same day before I went to the hospital and it was when my husband was frantically working on the broken plumbing God sent his angel to me. I don’t know why the upstairs plumbing broke open too, but I found it interesting and ironic. I won’t ever forget it, that’s for certain!